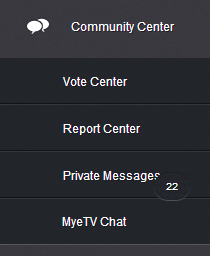 As we recently announced, we are working on the dashboard of MyeTV and we recently add a new feature called “Community Center”. Please note: this image is an example; somethings can change in the near/long future. The new MyeTV Community Center is a nice place to find friends and give your contribution to make MyeTV better than ever; all it’s in your hands. You can manage and view all your subscriptions in the “Subscription Center” or you can follow your favorite video in the “Vote Center” or follow all the reported videos, in the section “Report Center“, to vote and help all the MyeTV Community to make all the site clean; this section will also notice you if someone has reported some of your videos (you have no control over the report that must pass the exam of votes) with the information of who has reported and her reputation (reputation of the people will be very important in the MyeTV Community). The section “Private Messages” allows you to open private discussions with your friends in your friendlist, or with registered users of MyeTV; and with the MyeTV Chat you can stay in touch with your friend and the people who watch videos while chatting. The number at theright of “private messages” is the number of new messages (not readed) in your inbox. More features will be added soon and remember that some of this features are partially under construction. We will update this post as new features or existing features will be all out of upgrades.